A couple of weeks ago Micha Hannemann, Val’s fifth cousin once removed on the Flamme side of the family, got in touch through a link found on the web, and now we have met Micha, her parents, Michael and Irene Birch, and Micha’s daughter Andrea. We compared notes on the family history, reaching back to Francina van de Kaap, slave of Pieter Hacker. Irene’s mother, Johanna Maria Weilbach (born Steytler) had died last July at the age of 100, and they had found all kinds of family treasures, including portraits of the common ancestors, Johan Friedrich Wilhelm Flamme (1780-1831) and Johanna Sophia Breedschoe (1782-1836), and the commonplace book of their eldest daughter, Francina Dorothea Flamme, who married first Jonathan Joseph Burnard, and second Gerhardus Nicolaas Mechau, a Cape Town butcher. There were many snippets of poetry and drawings, some signed with names, some more obscurely by initials, and some just signed “A Friend”. But best of all were two portraits of Val and Micha’s common ancestors, J.F.W. Flamme and Johanna Sophia Breedschoe (or Breitschuh). On 1 January 1809 Johan Friedrich Wilhelm Flamme married Johanna Sophia Breedschoe and in 1817 he applied for citizenship. They had 11 children, though several of them died young. Johanna Sophia Breedschoe was the daughter of another soldier, Johan Christoph Franciscus Breitschuh, who arrived in the Cape Colony in 1773 from Halle in Germany, and also worked as a carpenter. He had two children by Francina van de Kaap who was a slave of Pieter Hacker. He had the children manumitted in 1787, and possibly their mother had died by then. Their eldest daughter Francina Dorothea Flamme (the one who kept the commonplace book) married Jonathan Joseph Burnard, but he was killed in a carriage accident, and her second marriage was to Gerhardus Nicolaas Mechau, whose mother Anna Mechau (born Jacobs) was the artist who filled the commonplace book with pictures, and presumably also painted the portraits of Francina’s parents. There are many Mechau descendants that we have managed to trace. Val’s great great great grand mother was a younger daughter of J.F.W. Flamma and Johanna Sophia Breedschoe. She was Petronella Francina Dorothea Flamme (1822-1893) who married Henry Crighton (1815-1870), and they too had numerous descendants. The Flamme boys mostly died young, and so there are no cousins with the Flamme surname in southern Africa, but apart from the Burnard, Mechau and Crighton descendants, the other Flamme girls married into the Wright, Beningfield, Laing, and Tait families. 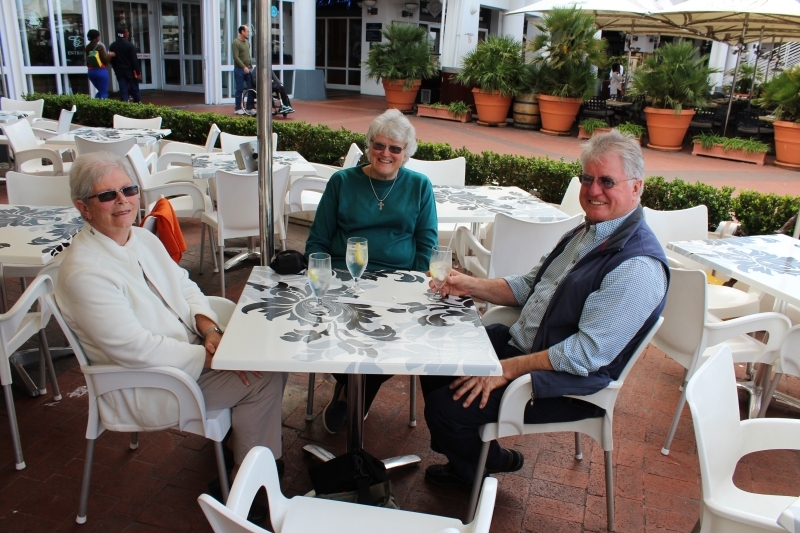 We finally packed up and left the Sun 1 Hotel at the Cape Town Foreshore, and went to spend a night with Jean & Paul Gray, Val’s cousins whom we had not met face to face before, only on Facebook and by e-mail. But first we went to see another old school friend of Val from Escombe, Cheryl Verrijt and her husband Theo. 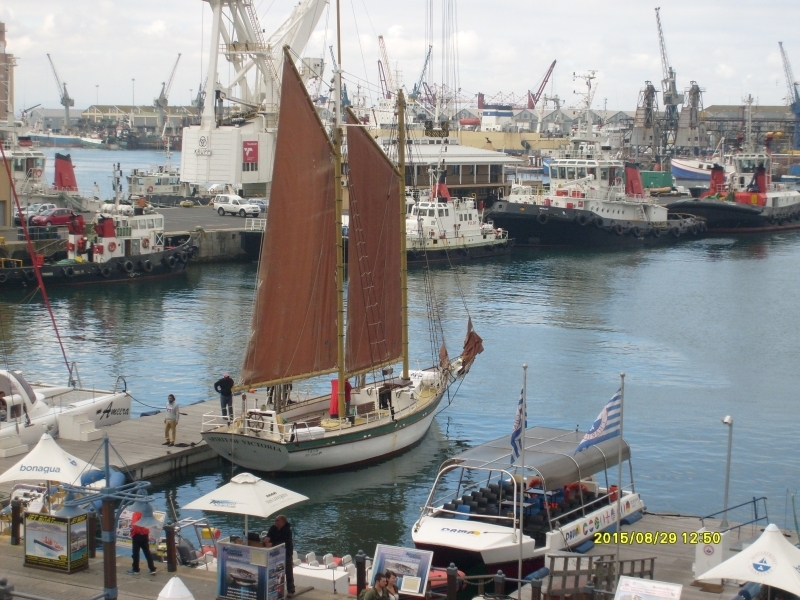 There wasn’t quite such a long time of not seeing them as with some of our other friends, as they had lived in Eshowe when we lived in Melmoth, and we had also seen them on a previous visit to Cape Town in 2003. While waiting for them we observed life in and around the Victoria and Albert Waterfront, a large shopping centre built next to Cape Town docks. It was interesting interesting to see how modern life encourages new outdoor activities. 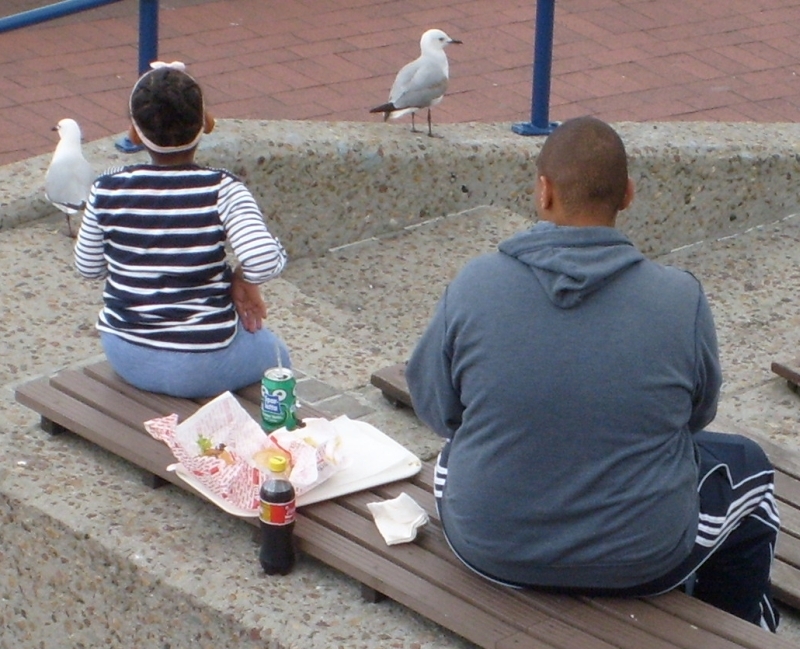 And there are also more traditional outdoor activities, like this little girl and her father eating fish and chips, with the gulls waiting around in the hope of titbits, and whenever they got too close the little girl would jump up and shriek and wave her arms to chase them away. .When Theo & Cheryl Verrijt arrived from an exhibition they had been attending nearby we had lunch at the San Marco restaurant. We then went back to Paul and Jean Gray and talked about the family history. Jean is a cousin on the Stewardson side of the family, and we had recently discovered several new generations of Stewardsons going back to Duffied in Derbyshire, England. It was quite a breakthrough, because we had known of Val’s great great great grandparents, Mr & Mrs Stewardson, we did not know their first names or where they had come from. There were references to them in books and journals about Namibia in the 1840s and 1850s, but they were always referred to as “Stewardson” and “Mrs Stewardson”. One frustrated author, writing a historical novel of their times, made up names for them, Ian and Norah, which got misleaqdingly incorporated into some serious historical publications, but we eventualy discovered that they were Francis Stewardson and Frances Morris, and they were married in Donisthorpe, on the border of Leicestershire and Derbyshire in England, in 1838. The Stewardsons went to Damaraland in the 1840s, and were involved in the beef cattle trade (some members of the Morris family were butchers in Cape Town, and at one time they had a contract to supply beef to the British garrison on St Helena). The Stewardsons’ daughter Kate married first to Fred Green, Val’s great great grandfather, and then, after Fred Green’s death, to George Robb, from whom Jean Mary Gray is descended. Though Val and Jean are the same age, they are half second cousins once removed, since Kate Stewardson was Val’s great great grandmother, and Jeans great grandmother. Kate had 16 children, of whom only four survived to adulthood. 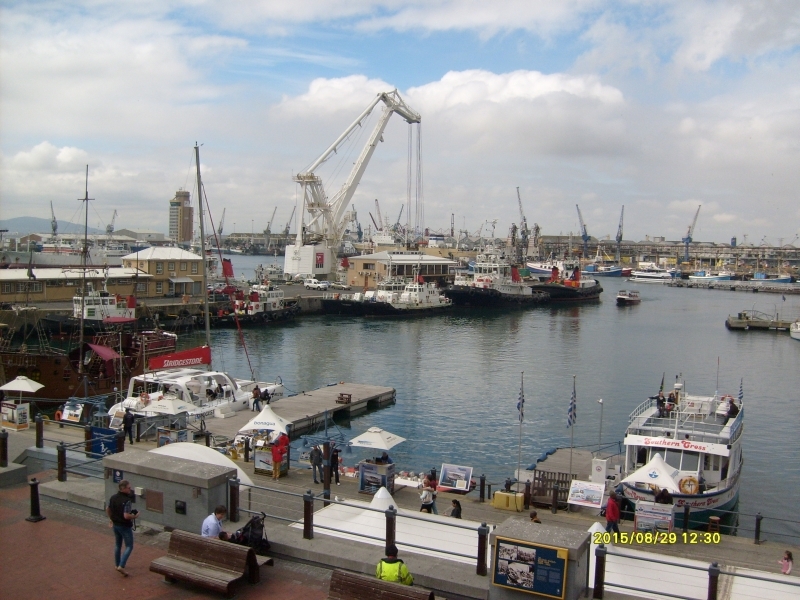 Continued at Cape Town to Hermanus. In Cape Town our days followed a regular pattern: breakfast at the hotel, research in the archives, and then visiting friends and family — at least those who had said they wanted to see us. 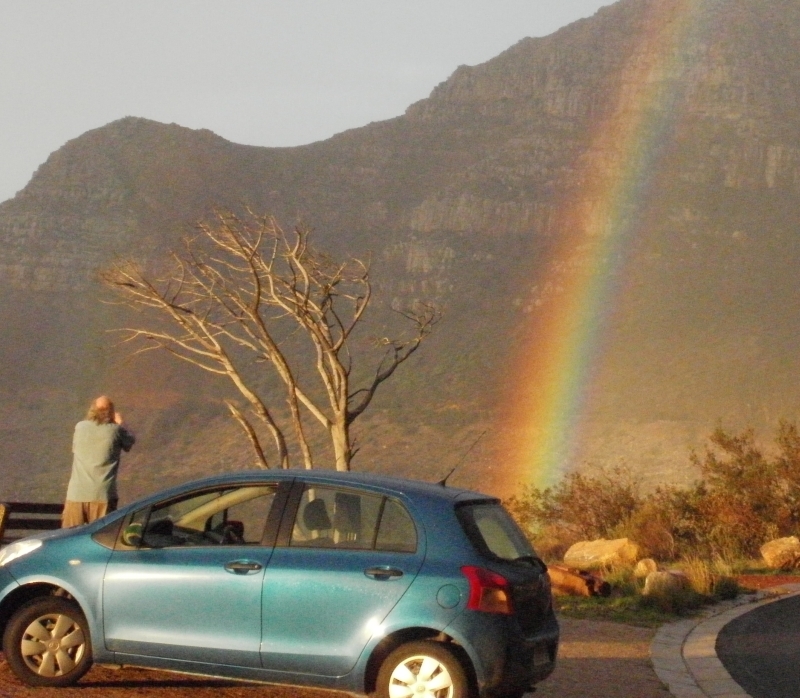 On Wednesday 26th August we drove down to Simonstown, following the Old Cape Road. 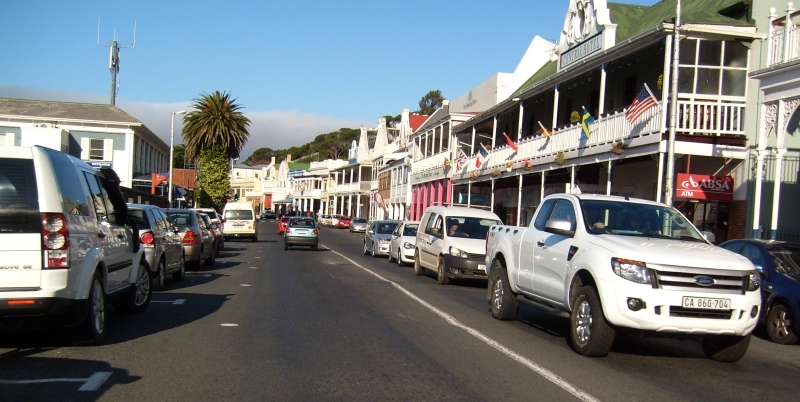 Simonstown is an interesting place in that most of the buildings on the main street are rather old, and therefore more interesting than the bland modern ones found in most towns. 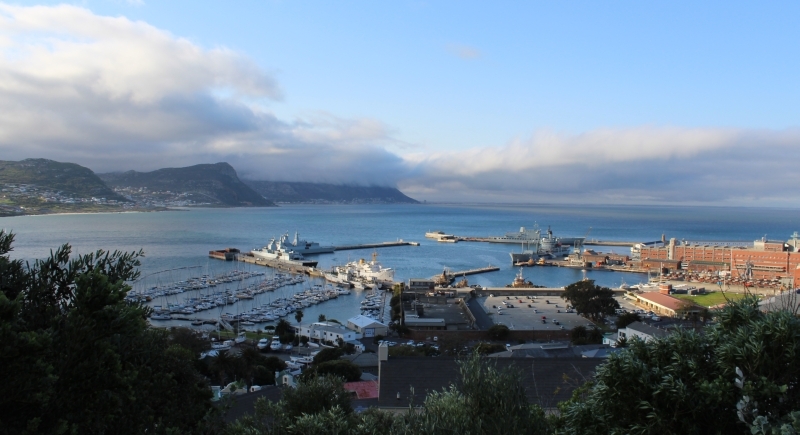 Simonstown looks like a very pleasant place, but has mainly been a naval base, famed for its harbour. 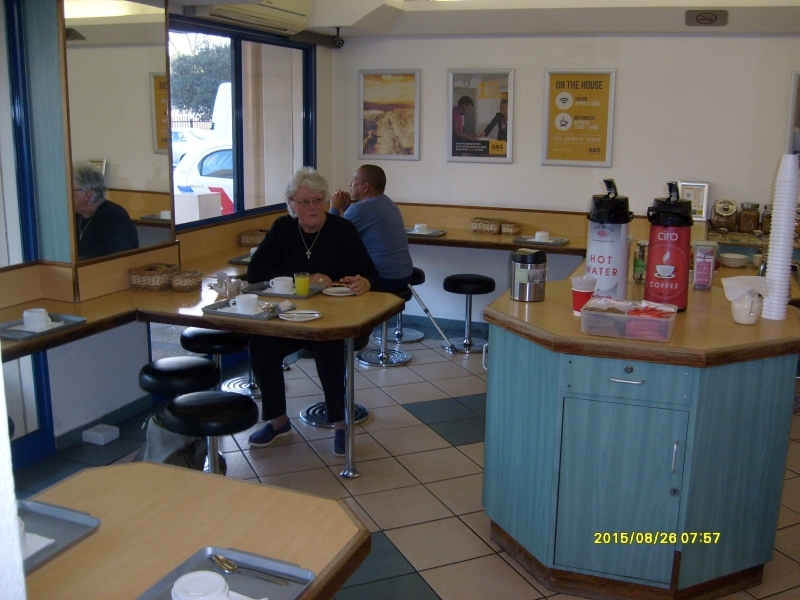 But places that sell take-away food, or at least the big chains like Steers, KFC, Nandos et al, like to have their own building designs, so were not visible in Simonstown. 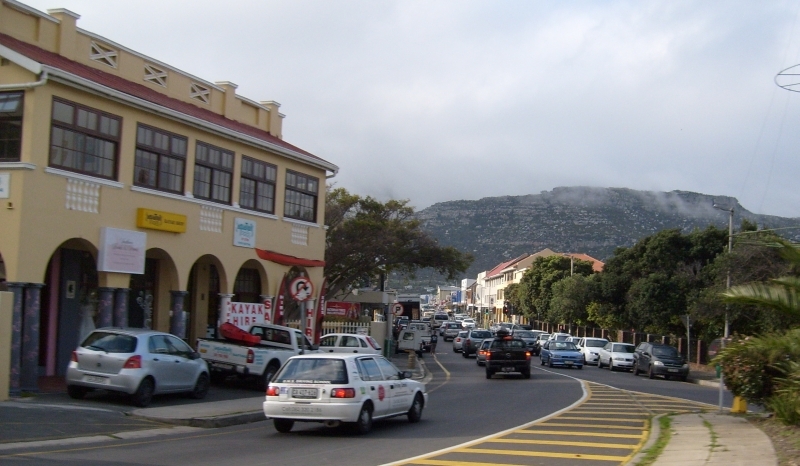 We were quite hungry, after having worked right through in the archives from breakfast, so we ended up buying chips in Fish Hoek, which has less interesting architecture. We then went to visit my cousin Brenda Coetzee in Muizenberg. The building where she lives had an interesting feature, a storefront church. I have often read about such things, but this was my first time to actually see one. Brenda is my second cousin on the Hannan side of the family, whom I knew quite well when we were younger, and she lived in Johannesburrg. She stayed with my mother when her parents were being divorced. But after that they moved to Cape Town and we lost touch until a couple of years ago, and the advent of Facebook, which makes it easier to keep in touch. 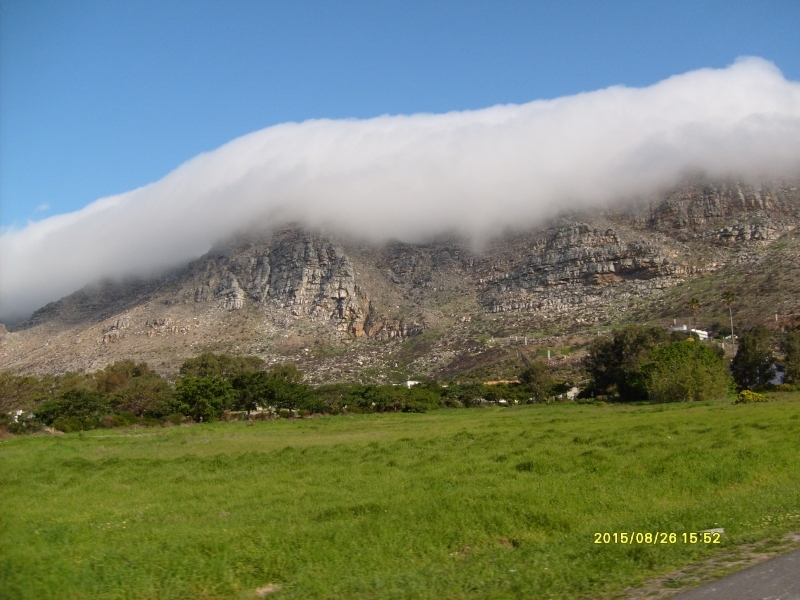 In August 2015 we are hoping to visit the Western Cape to do some family history research, and also to see living relatives and friends. Since we are now both retired, it will probably be the last chance we will ever have to go on such a holiday trip, and to visit the Cape Archives for research. If you would like to see us when we visit the Western Cape in August/September, please fill in the form below with your contact information. We are hoping, in particular, to find out more about the Morris, Stewardson and Dixon families, and ones related to them. Members of all these families were traders in what is now Namibia from 1840 onwards, They would trade manufactured goods (cloth, knives, axes & guns) for cattle, ostrich feathers and ivory. They would drive the cattle overland to Cape Town for market, replenish their stock-in-trade, and return by sea to Walvis Bay. 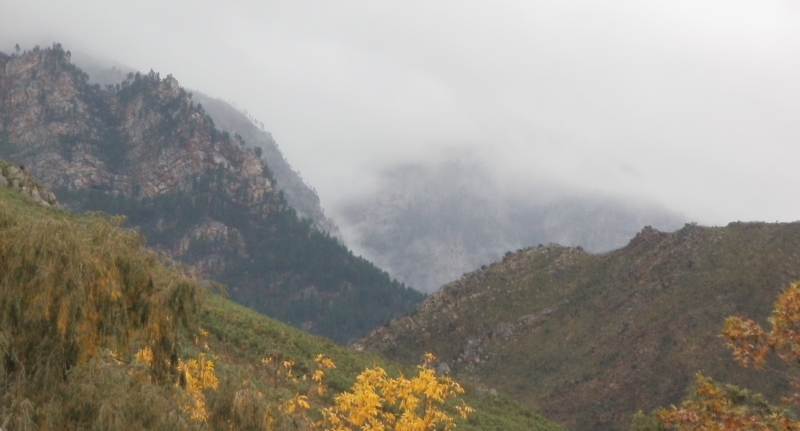 So we hope to travel down the N14 to the Northern Cape, with stops at Kuruman and Aughrabies Falls. The N14 joins the N7 at Springbok, and we hope to spend a few days at Kamieskroon, exploring that area, which the old-timers passed through on their way between Damaraland and Cape Town. One of the places that has been mentioned in their journeys is Leliefontein, the Methodist mission station, and one member of the Morris clan, Thomas Morris, is said to have lived there at one time. Another Morris, Abraham, also lived in the area when he was on the run from the Germans. He was one of the leaders of a rebellion against German rule in South West Africa in 1904. Sorting out the relationships between the various members of the Morris family is difficult, and a lot depends on compiling a chronology to show which members of the family were in which places at what times. The area, called Namaqualand, is also famous for its wild flowers in spring, so we are hoping to see some of them too. The families that livedf in or passed through Namaqualand are not the only ones we are interested in, of course. We’ll be looking up others — Green, Tapscott, Decker, Falkenberg, Crighton, MacLeod/McLeod, Growdon and many others in the archives as well, and, we hope, in real life too. When in Cape Town we usually stay at the Formula I Hotel (called something else now). It’s reasonably cheap, and very conveniently placed for going to the archives. The problem is, it’s very inconvenient for just about everything else — it’s in a semi-industrial area, so there is nothing to do there in the evenings, and nowhere in the vicinity where one can even get something to eat. But we hope that after the archives close at 4:00 pm we can visit family and friends, so if you know us, and wouldn’t be averse to a visit, please contact us and let us know (see form below). 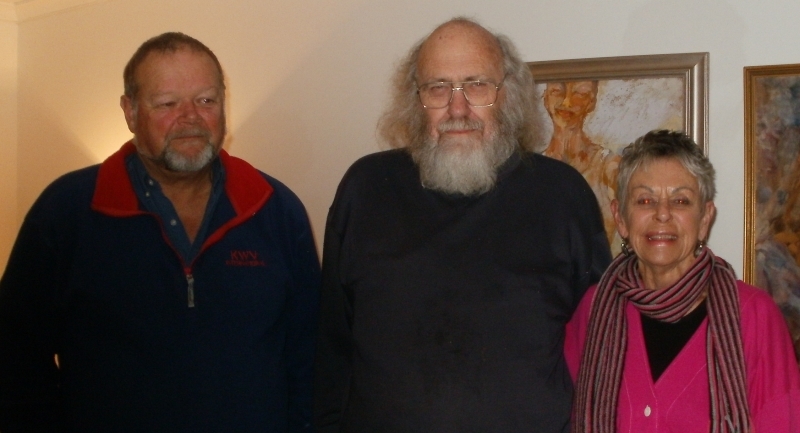 While in the Western Cape, or possibly on the way home, we hope to pay another visit to the Orthodox Centre at Robertson, and perhaps also to the Volmoed Community at Hermanus, to meet John de Gruchy and put the finishing touches to our book on the history of the Charismatic Renewal in South Africa, which we hope to have ready for publication by the end of the year. We are planning to return via the Eastern Cape and Free State, though with less definite ideas about the route. Quite a lot will depend on what we find in Cape Town, and whether we need to look at the Methodist Church archives in Grahamstown. I’ve been twice up the N7 from Cape Town to Windhoek, in 1971 and 1972, but on both occasions I passed through Namaqualand in the dark, so neither of us has ever actually seen it before. If you would like to meet us when we travel to the Western Cape in late August/early September, please use the contact form below so we can get in touch to let you know when we will be around and arrange to meet. Please note that whatever you type in this form will be seen only by me — it is not public! It will help us to see who we should try to get in touch with on our travels. 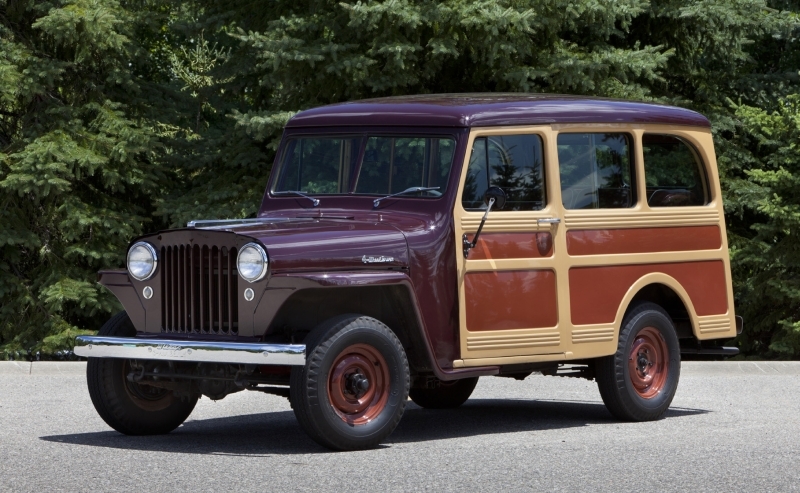 The Morris family has been one of our long-standing family puzzles. From Edward C. Tabler’s book Pioneers of South West Africa and Ngamiland (Cape Town, Balkema, 1973) we learned that Val’s great great grandmother Kate Stewardson’s mother was a daughter of one of the Morrises — Thomas Morris the elder and Thomas Morris the younger, the latter being a nephew of the former. Further research showed that “Thomas Morris the Elder” was actually James Morris, and that it was his sister Frances Morris who married Frank Stewardson, though we haven’t found a record of their marriage. There is more about the Stewardson family here. According to research done in the Namibian Archives, James Morris was born in Ashby de la Zouch in Leicestershire, England on 8 August 1817. There is a document in the Cape Town Archives giving a partial history of the Morris, Huskisson and Titterton families of Cape Town (Cape Archives, Accession A610), drawn up by a William Charles Titterton in about 1951. He was a grandson of James Morris. Thanks to FamilySearch, we were able to to discover the baptisms of the Morrises in the parishes of Nether Seal and Over Seal, near Ashby de la Zouch. Their parents were Thomas and Sarah Morris. Thanks to some very helpful people at the Rootschat site we were able to learn that the Thomas and Sarah Morris lived at Donisthorpe, on the border of Leicestershire and Derbyshire, where Thomas was a baker and later a butcher, and that he was born there about 1781. At that time there was no church in Donisthorpe, which explains why the children were baptised at Nether/Over Seal. Donisthorpe got its own church in 1838, though it apparently closed recently, so it is back to square one. It also appears from the 1851 census of Donisthorpe that Thomas Morris the eldest married a second time to Susanna, who was born in the Cape of Good Hope, so he himself must have been in the Western Cape at some time. These discoveries made over the last few months, enable us to construct a very provisional Morris family history. Thomas Morris was a butcher, and at least four of his children emigrated to the Cape Colony in the 1820s or 1830s, where his eldest son Thomas was also a butcher. Perhaps the whole family emigrated, or perhaps the father just visited them there. 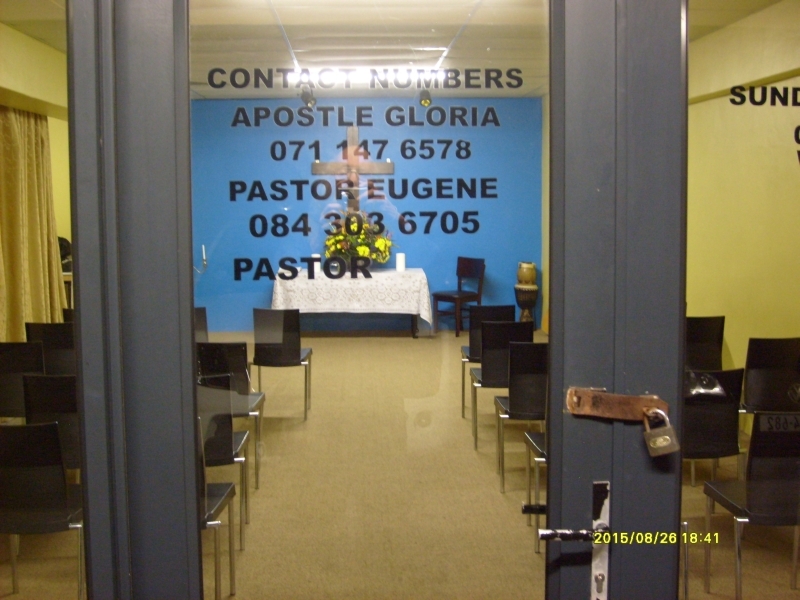 Though they were baptised in the Anglican Church at Nether/Over Seal, in the Cape the family were Methodists. Thomas Morris had a contract to supply meat to the British government and his younger brother James went to Namaland and Damaraland (now part of Namibia) apparently with the object of procuring a regular supply of cattle for the market. The Hereros (then called “Damaras” by outsiders) were great cattle herders. So James Morris and his wife Mary Elizabeth Huskisson went with another family, the Dixons, overland through the Northern Cape and Namaland, visiting Methodist missionaries on the way. The Morrises had two sons with them. Eventually they reached Walvis Bay in mid-1844, and they wanted to return to Cape Town by sea. Morris and Dixon reached Walvis Bay in mid-1844, and Morris and his family sailed for Cape Town in Lawton’s vessel so that Mrs Morris could be confined there, but contrary winds drove the ship back. Morris joined Dixon at Sandfontein where they built a store and each man built a house. Mrs Morris gave birth to a daughter there. And the Methodist baptism register in Cape Town shows the daughter, Sarah Ann, as being born on 6 September 1844, and being baptised on 6 December 1847. James Morris apparently continued to live in Damaraland until the end of the 1840s, when, according to Tabler, he handed over the business to his nephew Thomas, who was dead by August 1863, and was buried in the Kuiseb River canyon. The problem here is knowing where this Thomas fits into the family. We know that James Morris’s elder brother Thomas had a son Thomas, but he appears to have been alive in 1864, because when his father went insolvent then, he was occupting most of the property. The other brother, William Morris, may have had a son Thomas, but we have found no record of his marriage or children. There are records of a William Morris (perhaps more than one) in the Western Cape in the middle of the 19th century, but the problem is knowing which records pertain to which William, and which of them, if any, was a member of this family. Frances Morris, the sister of Thoms, William and James, also went to Damaraland in the later 1840s with her husband Frank Stewardson, and their daughter Kate (Val’s great great grandmother) was born at Rooibank, near Walvis Bay about 1848. According to the Lutheran missionary C.H. Hahn, James Morris, the Wesleyan trader, lived in fierce enmity (arger Feindschaft) with his brother-in-law Frank Stewardson, which might explain the lack of any mention of Frances in the Titterton history. We’re trying to sort out these relationships as we hope to go to Namibia later in the year and do some fossicking in the archives in the hope of finding more, and tying up some loose ends. One of the more interesting loose ends is Abraham Morris (1872-1922), the leader of the 1922 Bondelswarts Rebellion. According to the Dictionary of South African Biography (Vol III, p 634) he was the son of an English trader and a Bondelswarts mother and was educated in the Cape Colony, so he could quite possibly be related — but how? A Beningfield family group has recently been started on Facebook. This is interesting to us because many of the South African Beningfields are related to us (though we are not descended from Beningfields) through Louisa Flamme, who married Samuel Beningfield in Cape Town in 1833. In the early 1840s the family moved to Durban, and Samuel Beningfield became a well-known auctioneer, and some of his sons followed him in that occupation, and their descendants are cousins in varying degrees. Some are more closely related than others, because Samuel and Louisa Beningfield’s son Reuben Widdows Beningfield married his first cousin Martha Crighton, whose mother, Petronella Francina Dorothea Flamme, was Louisa Beningfield’s sister. Though you will not find any descendants of the Flamme family with the Flamme surname, we have managed to record 1683 descendants of Johan Friedrich Wilhelm Flamme (1780-1831) and Johanna Sophia Breedschoe (or Breitschuh) (1782-1836). Those on our side of the family are Crightons, but there are many descendants with other surnames as well, some of the most common (apart from Crighton and Beningfield) being Mechau/Michau, Haupt, Enslin, and von Backstrom. Johan Friedrich Wilhelm Flamme came from Twiste in Hesse-Nassau, Germany. Johanna Sophia Breetschoe was the daughter of Johan Christoph Franciscus Breidschuh, a German, and Francina van de Kaap, a slave owned by Peter Hacker. Johanna Sophia Breedschoe and her sister were born in slavery, and were manumitted by their father. And they are the ancestors we have in common with the Beningfields. Among the descendants of the Natal Beningfields are the Hickman, Grice and O’Flaherty families. The 1683 Flamme descendants (565 of whom are Beningfield descendants) are only the ones we know about. We haven’t been able to trace the others yet. But we hope that some of them will be interested enough to help us add to the family history.